The incidence and severity of chilling injury depend upon the cultivar (‘Fuyu' is chilling-sensitive while ‘Hachiya' is not chilling-sensitive), storage temperature and duration. 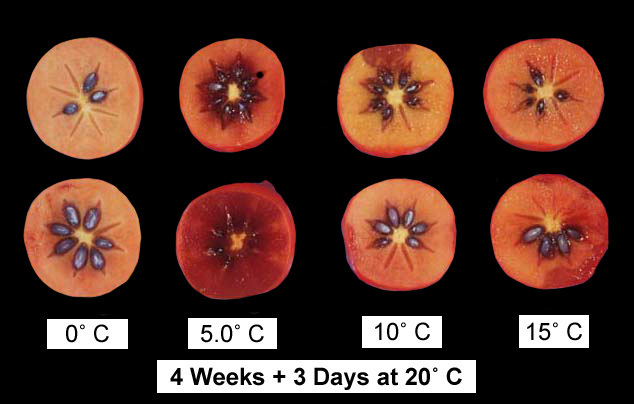 Chilling injury can be a major cause of deterioration of ‘Fuyu' persimmons during marketing after exposure to temperatures below 15°C (59°F). Symptom development is fastest at 5-7°C (41-45°F) and slowest at 0°C (32°F), which is the recommended storage and transport temperature for persimmons. ‘Fuyu' persimmons exhibit chilling injury symptoms if kept at temperatures between 2°C (36°F) and 15°C (59°F). Upon transfer to higher temperatures the severity of the symptoms (flesh softening, browning, and water-soaked appearance) increases and renders the fruits unmarketable. Respiration and ethylene production rates of chilled ‘Fuyu' persimmons are higher than those of non-chilled fruits. Exposure to ethylene at 1 ppm or higher aggravates chilling symptoms of ‘Fuyu' persimmons, while controlled atmospheres ameliorate these symptoms. Avoid exposure of ‘Fuyu' persimmons to temperatures between 2°C (36°F) and 15°C (59°F). Optimum storage and transport temperature is 0°C (32°F). Avoid exposure to ethylene above 1 ppm throughout postharvest handling of ‘Fuyu' persimmons. Use of controlled atmosphere of 3-5% O2 + 5-8% CO2 at temperatures below 5°C (41°F) reduced chilling injury. Beede, R. H. 1983. The storage performance of the Fuyu persimmon and its suscep-tibility to chilling injury. M. Sc. Thesis, Department of Pomology, University of California, Davis. Collins, R. J. and J. S. Tisdell. 1995. The influence of storage time and temperature on chilling injury in Fuyu and Suruga persimmon (Diospyros khaki L.) grown in subtropical Australia. Postharvest Biology & Technology 6:149-157. MacRae, E. A. 1987. Development of chilling injury in New Zealand grown Fuyu persimmon during storage. N.Z.J. Exp. Agric. 15:333-344. The UC Postharvest Technology Center grants users permission to download textual pages (including PDF files) from this World Wide Web site for personal use or to reproduce them for educational purposes, but credit lines and copyright notices within the pages must not be removed or modified. Except for these specified uses, no part of the textual materials available on the UC Postharvest Technology Center Web site may be copied, downloaded, stored in a retrieval system, further transmitted or otherwise reproduced, stored, disseminated, transferred or used, in any form or by any means, except as permitted herein or with the University of California's prior written agreement. Request permission from UC Postharvest Technology Center. Distribution for commercial purposes is prohibited. Links to any of these UC Postharvest Technology Center pages are permitted, but no endorsement of the linking site or products mentioned in the linking page is intended or implied by such a link. Example: Mitchell, F. G., G. Mayer, and A. A. Kader. 1980. Injuries cause deterioration of sweet cherries. California Agiculture 34(3):14-15.
http://ucanr.edu/sites/Postharvest_Technology_Center_/Commodity_Resources/Fruit_Physiological_Disorders/?uid=20&ds=822 (Accessed January 18, 2014).